High Noon at Cagayan Garden runs until November 14. (SPOT.ph) A Zen garden awaits visitors on the second floor of the Bellas Artes Outpost in Makati. Walk around, and you'll feel like you're by the sea, the sun streaming through the wooden slats above you. Except that you're actually indoors, right off perennially busy Chino Roces. 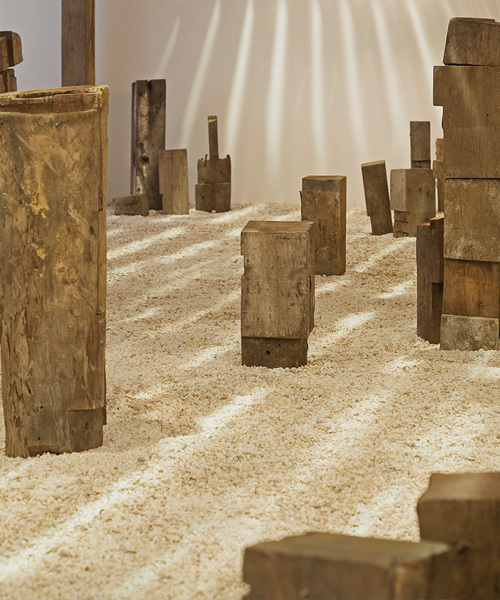 The little patch of tranquility is an installation that’s part of the gallery’s latest exhibit, titled High Noon at Cagayan Garden, by Australia-based Filipino artists Alfredo and Isabel Aquilizan. It runs until November 14. The piece was created during the Aquilizans' artist residency with the Bellas Artes Projects, a non-profit foundation in Bataan founded in 2013 by Manila-based art patron Jam Acuzar. In this show, the Aquilizans present us with issues of displacement, migration, and the yearning to create permanent spaces in a temporary world; to encourage us to contemplate how spaces can help bring back memories and allow one to re-think a transitory existence. 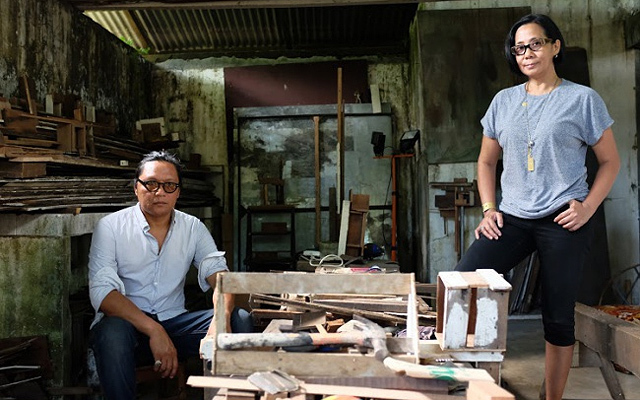 During their residency, Alfredo found inspiration from the four old wooden houses—originally from Cagayan Valley—that serve as temporary homes for the artists at the Bellas Artes Projects compound within the sprawling Las Casas Filipinas de Acuzar. Hailing from Cagayan Valley himself, he instantly felt a connection to the houses, and together with his wife, Isabel, they took interest in an area found below the houses locally known as silong. This space is common in Filipino wooden houses in the provinces. Houses are elevated from the ground with hardwood stilts to keep flood and pests out, creating silong, an area underneath that provides shade or protection from rain. Locals would normally use the area as an extended outdoor kitchen or a storage den. At noon, when the sunlight pierces through the gaps of the house’s floorboards, it turns into a space for meditation and rest, especially during siesta. Originally installed outdoors in Bataan, the garden was transferred to Makati, into a building closed off from natural light. To retain the purpose of the work, Light Designer Mark Wilson collaborated with the Aquilizans to reproduce the high-noon effect, successfully creating the illusion of natural light. Both born and raised in the Philippines, Alfredo and Isabel Aquilizan decided to move to Australia along with their five children in 2006. This was not an easy decision for them, and their faces gave a hint of nostalgia and melancholy when they narrated how they never realized that they would lose their Philippine citizenship in the process of acquiring their Australian one. To many, it may just seem like a piece of paper but to the Aquilizans, the thought of losing the right to their motherland was unimaginable. (They eventually re-acquired their Filipino citizenships.) When asked about their decision to leave the country, the couple simply talked about the opportunities abroad and the sense of practicality that one needs when raising a family. 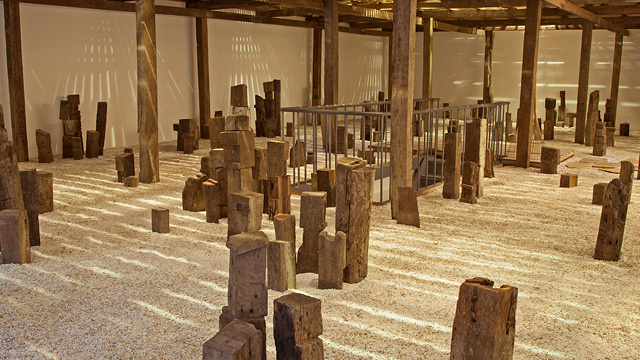 In Australia, they exhibited “In-Habit: Project Another Country” at the Sherman Contemporary Art Foundation gallery space in 2012. 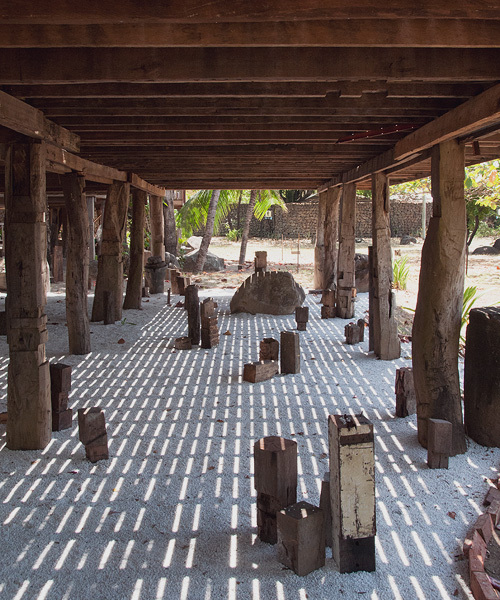 The work consists of a massive installation reminiscent of the stilt settlements of the Badjaos, a group of indigenous people from Mindanao. Constantly driven by territorial disputes and conflicts, they usually live in boats or in makeshift shelters raised along the coasts. In doing so, the community asserts their rights to a territory, though temporary. In most of their works, the Aquilizans seek to establish presence and challenge the opposing ideas of permanence and impermanence, construction and deconstruction, displacement and status. Their installations are mostly site-specific and respectful of the place and community around it. When commissioned for a project, they would arrive at the location empty-handed and research extensively. They would also source materials locally, usually from found objects. In Japan, they built installations made from things left in abandoned houses by owners who migrated to the cities. They employed a similar technique for High Noon at Cagayan Garden. The found objects, memories of Cagayan Valley, and tradition of the silong all evoke a sense of romanticism when you walk through the installation. Questions emerge from looking at the carefully arranged posts while thinking about the houses they came from and their previous owners. What kind of men and women might have marveled through them? What new meaning can be taken from this context? 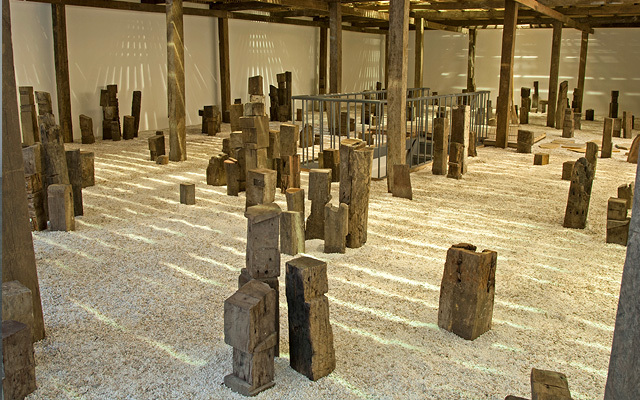 The emphasis of the issues the Aquilizans wish to explore manifest at every level and every area of the work: transferring the work from Bataan to Manila, using discarded wooden posts and excess marble stones as material; and highlighting how a space can activate aspects of our emotional state. In essence, the Aquilizans have created what they sought to convey: a shelter for the displaced, disenfranchised, and the abandoned. High Noon at Cagayan Garden runs until November 14 at Bellas Artes Outpost, 2/F Building C Karrivin Plaza, 2316 Chino Roces Avenue, Makati City. 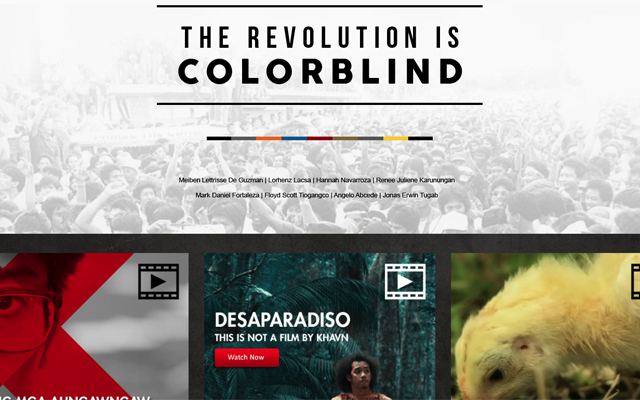 For more information, visit Bellas Artes' website.